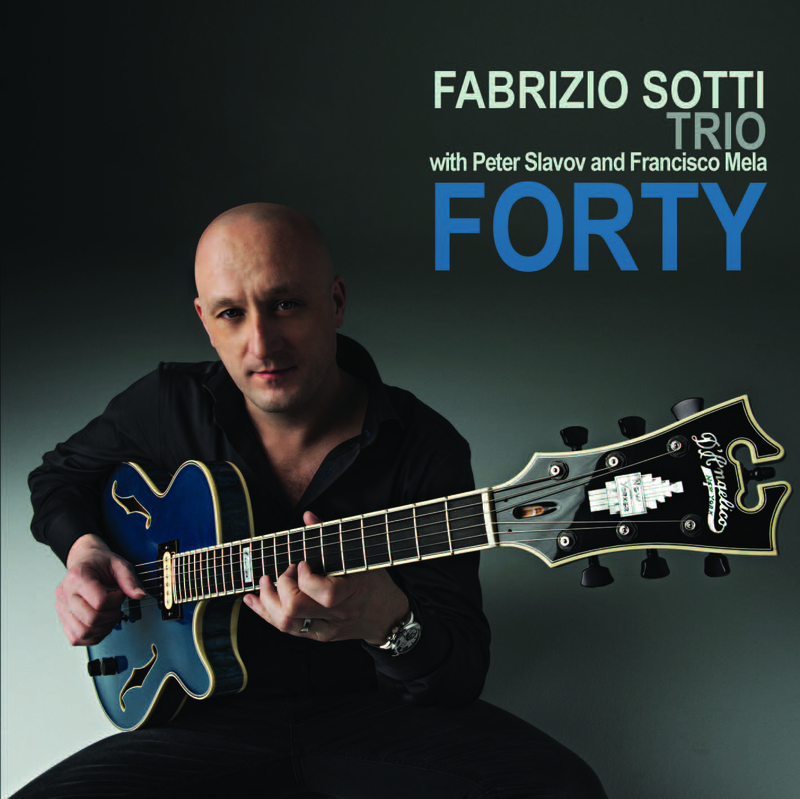 James Nadal of All About Jazz Gives Fabrizio Sotti’s ‘Forty’ 4 Stars! As jazz guitar continues to evolve with the introduction of modern influences, some of the more distinguished players are going back to basics. Acknowledged as a remarkable accompanist who can cross genres at will, Fabrizio Sotti has also established himself as genuine guitar stylist. Forty is his fourth release as leader, which represents not only a milestone in his age, but a continuous dedication to refining his craft. This is a departure from previous recordings on which Sotti covered quite a lot of musical territory. Now claiming his own signature model D’Angelico guitar, and prepared with original compositions, Forty presents an intriguing set of melodic improvisations based around his professional development and personal life. The trio format encompasses bassist Peter Slavov, who hails from Bulgaria, adding a classical European background, and Cuban-born drummer Francisco Mela, who brings an innate rhythmic sense of swing. The minor blues “Redemption,” is a slow yet deliberate testament to the instrument which has guided his destiny. His appreciation of the be-bop idiom is evident on “Dangerous Walk,” while “Is That What You Think,” keeps the momentum going in a straight ahead direction. Both of these demonstrate that Sotti is technically proficient, and can play around the melody at will. “Beginning Now,” is a melancholic solo classical guitar interlude, with strong family connections. The only cover is Antonio Carlos Jobim‘s “How Insensitive,” a sympathetic samba in homage to his grandfather. The Latin pulsation continues with “Thalia,” a joyful number dedicated to his daughter, where he admittedly nods to the influential Jim Hall, while adding individual embellishments. Bassist Peter Slavov accompanies Sotti on the ballad “So Far So Close,” performed as a duo. An intricate and expressive venture, Slavov adds the appropriate soloing as an acoustical cushion for the guitar. Though Sotti has been an asserted New Yorker for years now, he is very much an Italian at heart. The romanticism of his heritage evident on “The Bridge,” a blues tinged love song composed for his wife, and the Ponte dei Sospire (Bridge of Sighs) in Venice, where they were married. The title track is an affirmation that though life is thought to begin at forty, one better have something to show by then. The song begins in a staggered manner, easing into a smooth rite of passage, takes some interesting twists and turns, and comes to a firm conclusion. This appears to reflect Fabrizzio Sotti at this juncture, a glimpse of a musician in motion, yet taking his time. Though he has dazzling jazz chops, Sotti chose the sparse road of simplicity to express this music, thus revealing his maturity as a musician, for sometimes less is more. Track Listing: Redemption; Dangerous walk; Is That What You Think; Beginning Now; How Insensitive; Thalia; So Far So Close; Forty; Intro to The Bridge; The Bridge. Personnel: Fabrizio Sotti: guitars; Peter Slavov: bass; Francisco Mela: drums.